Get enough rest. If you are too tired, your body will not have the energy to produce milk properly. So try to catch up on rest and sleep during the day if you are up a lot at night. 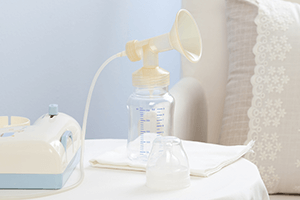 Allow your baby to nurse frequently for as long as he wants. The more often your breasts are stimulated, the more milk your body produces. At least 8 feedings in a 24-hour period is ideal, more if possible. Offer your baby both breasts at every feeding to trigger your body to produce more breast milk. Switch breasts as soon as your baby slows down. If you can, switch again and offer each breast twice during a single feeding session to make sure your breasts are empty. Let your baby nurse for as long as possible, until he falls asleep or detaches. 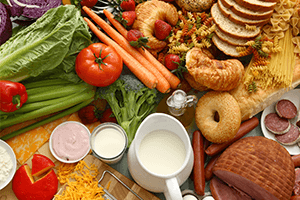 Have plenty of fiber, found in wholegrain bread and breakfast cereals, pasta, rice, pulses (such as beans and lentils), fruits and vegetables. Include dairy as part of your diet by consuming milk, cheese and yoghurt which contain calcium and are a useful source of protein. Eat when you feel hungry and choose healthy snacks. Drink 10-12 glasses of water per day (approximately 2.5 to 3.0 liters).Avoid drinking a lot of fluids that contain caffeine such as coffee and tea because it may affect your baby’s sleeping habits and make him more alert. As your baby grows, he will feed for longer but less often during the day & night.The more you breast feed, the more milk your body will naturally produce. You should always aid this natural production by taking care of yourself, resting and sleeping well, eating healthy, exercising lightly, and not stressing.Expressing extra breast milk, even when not intended for feeding your baby, further aids the production of breast milk and helps ease engorged or uncomfortable breasts.Your breast milk at any given time naturally contains all the essential nutrition your baby needs at their specific age. For example, breast milk expressed during the first few weeks of delivery may not meet the needs of your baby at 3 months of age. The longer you store expressed breast milk, the more Vitamin C is lost from the milk. Make sure you are familiar with how to safely store and use your expressed milk. Breastfeed at least 8-12 times per day for approximately 20-30 minutes per session, the more the breast is suckled, the more milk it will produce. Poor positioning and a shallow latch-on can reduce the amount of milk baby gets. Once baby is latched on well, try to apply gentle pressure to the breast using your hand which could help the milk flow more quickly and keep baby interested in feeding actively for longer. Recent research indicates that after the first month of natural breastfeeding, emptying the breast fully appears to be more effective at increasing the rate of milk production. Take good care of yourself. Fatigue and stress can interfere with your let-down which is why it is important to eat and rest well.